An epic for the ages – did you expect anything less? The wait is finally over – and you guessed it, it's been worth it. Seven years in the making, it's time to saddle up for Red Dead Redemption 2. Out on Friday October 26, its been in the hands of reviewers for just over a week now and, as expected, the verdict is overwhelmingly positive. From its depiction of a fading Wild West dream to its beautiful rendering of American wilderness, it's being hailed as a classic of the generation, and one of the most ambitious of all time. 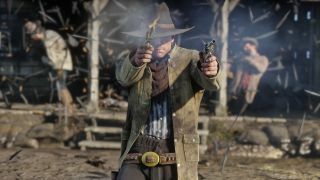 While we've not had enough time with the game yet to give it the thorough, comprehensive test that you'd expect from a TechRadar review, we've rounded up the verdicts of those ready to share their opinions for your reading pleasure below, along with a link to each publication's full review. If you weren't already excited, now's the time to let rip.